Exquisite 2oz silver bar with a 1oz silver panda coin placed in it. 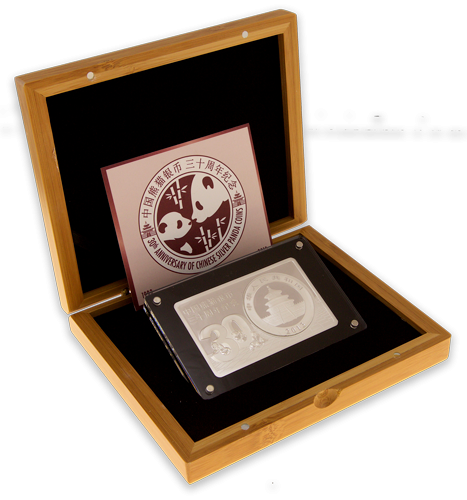 The 30th anniversary of the Chinese Panda is celebrated with this exquisite 2oz silver bar with a 1oz silver panda coin placed in it. Issued by the Chinese Mint. The Panda is considered extremely precious and therefore this proves to be a highly significant coin. The panda is one of the most recognised animals from China and is considered extremely precious. The 30th anniversary of the Chinese Panda is celebrated with this exquisite 2oz silver bar with a 1oz silver panda coin placed in it. The Chinese Panda silver coin changes the reverse design annually; it is one of the very few sovereign bullion coin that does this. The obverse and reverse of the bar both carry the design of the coin seamlessly. 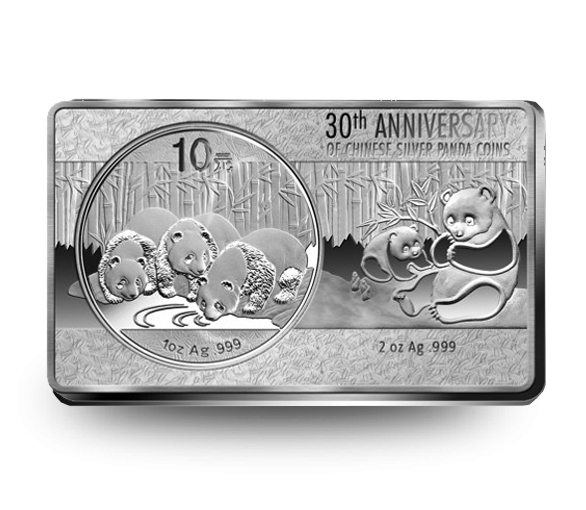 The bar’s obverse features a panda design with two pandas sitting in the wild. The coin’s obverse also features the panda design with three pandas drinking from a stream. The bar’s reverse features numerous Chinese symbols along with a large “30” and several pandas sitting around the numerals. The reverse also contains the bar’s 2013 mint year.